The latest Ipsos MORI poll puts Labour three points ahead of the Tories with support for the Liberal Democrats falling from 18 to 15 per cent. 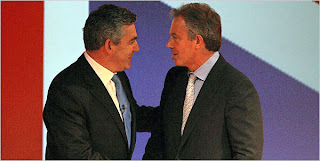 More importantly, the poll published in the Observer shows that 40 per cent of voters believe Gordon Brown would make the more capable Prime Minister, compared with just 22 per cent for David Cameron. Okay, so it’s just one poll. But it’s significant as Gordon Brown is still days off from becoming the Prime Minister, he hasn't yet unvailed his policies or announced his new team. Meanwhile, Mr. Cameron’s initially confident leadership style has wobbled after a backlash from Conservative Party members over his education policy; with political commentators now openly questioning whether he has any substance to his political platform. It proves to be an interesting period in UK politics but one thing is certain. The British public will judge their politicians specifically on what they offer to them. They will want to see well thought out policies on the economy, crime, health, education, housing and all the other areas that contributes to their long term security and quality of life. On that criteria, Gordon Brown has already been ahead for a very long time. Traffic calming from "the horse’s mouth"